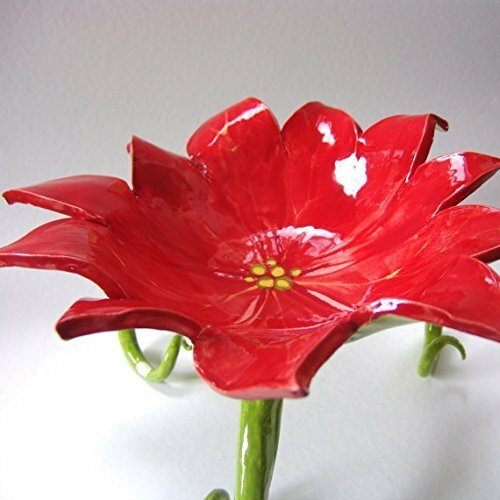 A beautiful pottery Poinsettia Serving Bowl with hand-painted Christmas flower inside fired in bright red. The outside is bright lime green with white polka-dots and tall curly feet. It is fired with lead free glazes, making it safe to use for food -- a focal piece for your holiday buffet!! --or-- on the coffee table full of seasonal snacks -- Ours is always full of Chex Mix :) measures 10½ - 11½" across (10" at the legs) x 6½ - 7" tall. → this is an original one of a kind hand built item, exactly as photographed, → Finished and ready to ship, TODAY ! ! This roll basket may be small but it can hold up to 10 dinner rolls! The handwoven basket has been stained medium oak and jacobean brown and dipped in a gloss finish to give it extra strength and easy cleaning with a damp cloth. 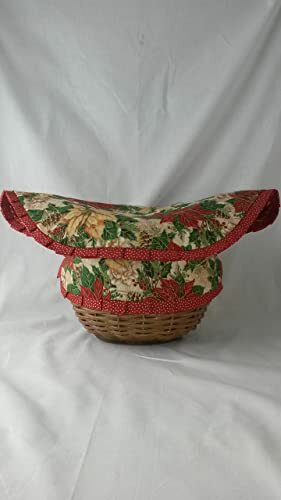 The hand quilted fabrics include the main poinsettia fabric in shades of red, green , gold, and beige, a red and gold polka dot, and a red and gold stripe. The liner expands to fit just the right amount of any baked goods you need for your Holiday table. From top of expanded but closed liner to solid wood base this basket stands 13 inches tall. It is oval in shape and measures 8x7 inches. The liner is removable and hand washable, drip dry, warm iron to keep the liner looking great year after year. This is a one of a kind basket for your one of a kind family dinner! 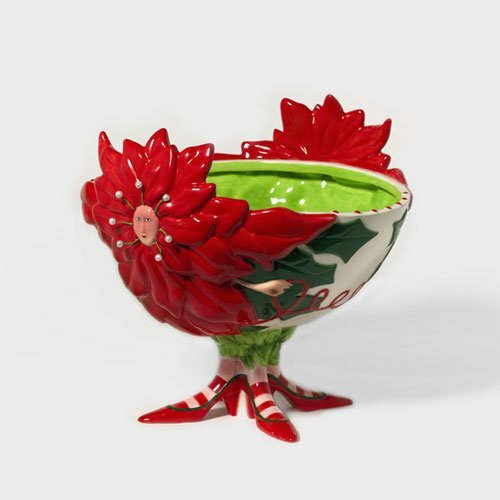 A whimsical pottery Holiday Bowl with poinsettias, polka-dots, curly legs, it is both fun & funky. 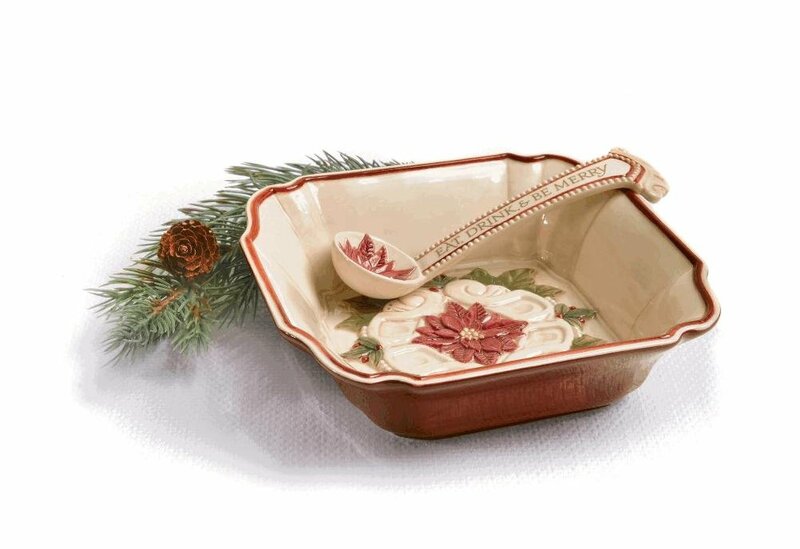 A beautiful ceramic dish for your Holiday Home Decor. This ceramic serving bowl is glazed with bright festive lime green & white polka-dots on the outside, with an original hand-painted poinsettia floral design on the inside. It sets on 3 long curly legs. It measures 9" across (11" wide @ the legs) x 6½" tall (2+" deep inside) It is fired with lead-free glazes, safe to use for food -- a great size for snax and serving → an original one of a kind hand-built item, exactly as photographed → Finished and ready to ship -- TODAY ! ! 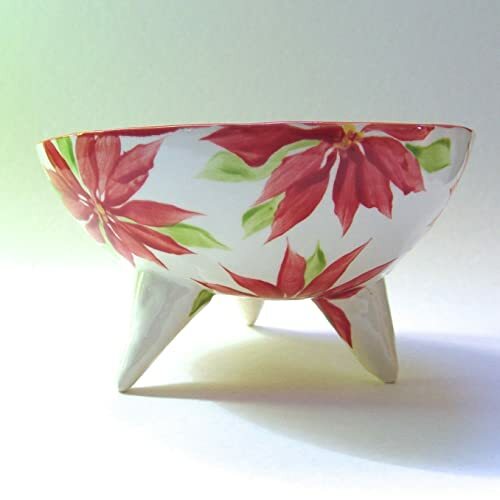 A beautiful Christmas Poinsettia ceramic Bowl for your winter holiday. 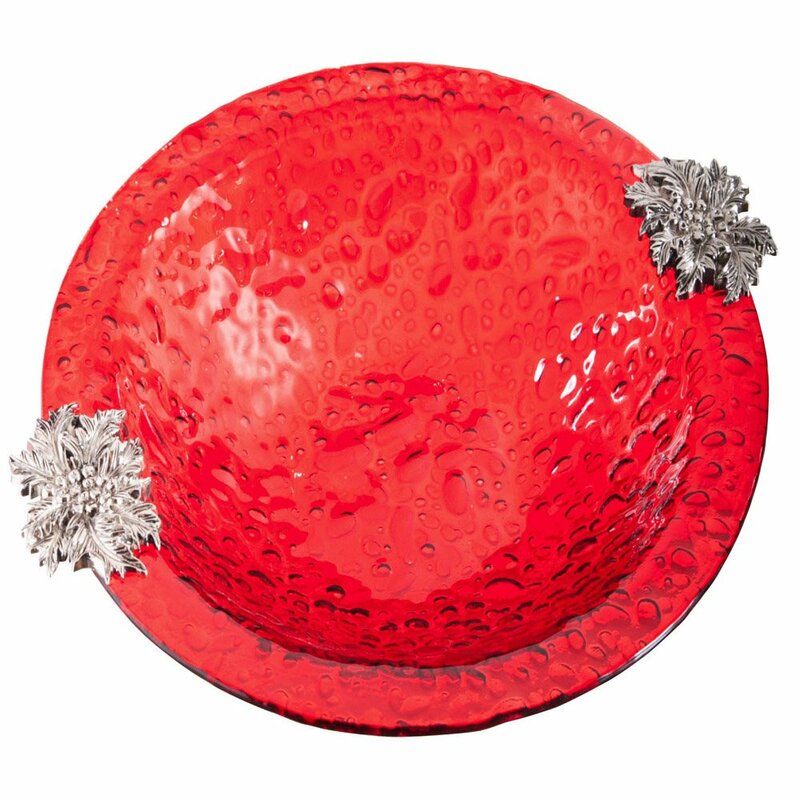 Fired with bright red & white polka-dots on the inside and hand-painted poinsettia floral print on the outside. Brighten up all of your special dishes with this awesome handmade bowl. Safe for food and hand washing -- perfect size for nuts & snacks! measures 7" across x 4" tall → an original one of a kind hand-built item, exactly as photographed → Finished and ready to ship -- TODAY ! ! 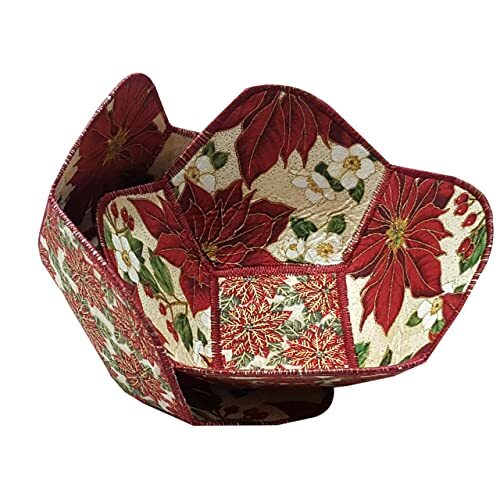 This listing is for one small reversible fabric bowl in Poinsettia fabrics. 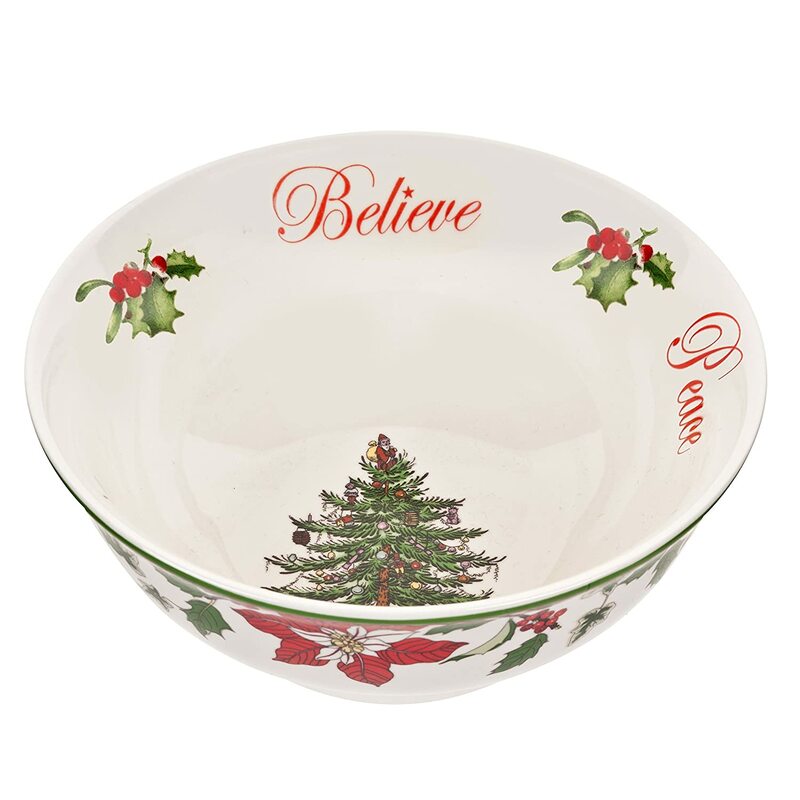 Each bowl has the same large poinsettia printed fabric on one side and small printed poinsettia fabric on the other. They can be reversed to show the side of your choosing. They can be used to hold almost anything (see pictures for ideas or use however you wish. 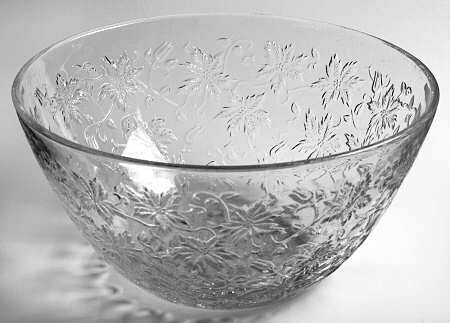 Bowls can be machine washed and dried on gentle cycle and measure approximately 6" diameter x 2.5" square base x 1.5" - 3" deep. Give your holidays meals a fun, festive accent with Botanical Christmas, a Certified International pattern designed by artist Susan Winget. Your guests will love this colorful round platter featuring blooming red poinsettia's and perching cardinals. Designed with classic red, green and white color scheme. Great for appetizers, sides and more. 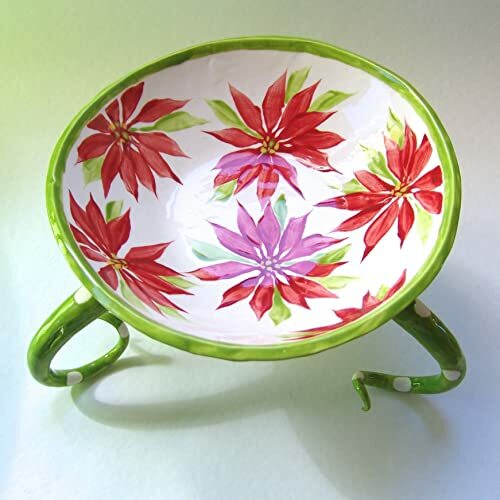 Are You Looking for Poinsettia Chip & Dip Bowls? 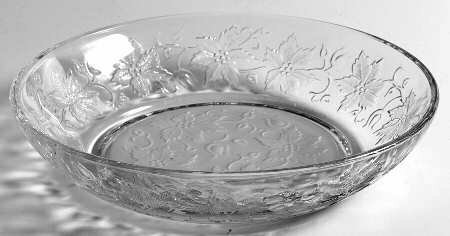 Are You Looking for Poinsettia Serving Plates & Trays?